Above 49 of the 70 Corvair builders at CC#20 in Hillsdale MI June 2011. John, Thanks for your note. Looking at the photo of the builders at CC#20 brought back a lot of memories and made me think of all the things we will get done at Colleges this year. I borrowed this one also, it shows Johns ‘closed case’ with an original Dan Gen 1 bearing installed. This is one of Dan’s original housings, the first 120 or so were heat-treated castings. Today they are made from CNC billets of 6061. Dan made the switch to take out a lot of the different steps in the manufacturing process like working with a foundry and heat treater. They cost more to make as a billet, but he kept the same price to builders. 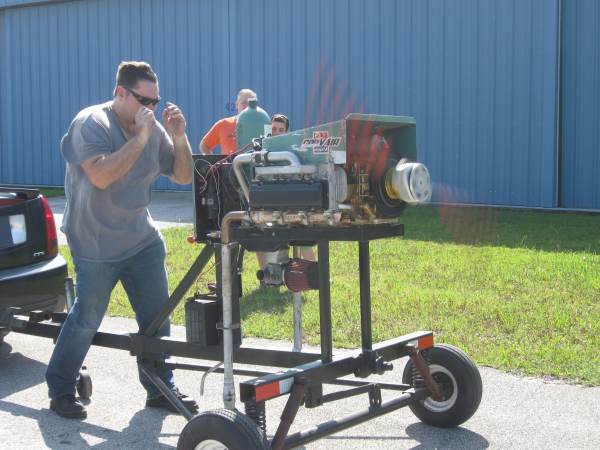 Above, Spenser Gould, designer and Builder of the SP-500, with his first engine run at CC#23 in Palatka Florida, June 2012.
intake and carb and throttle connections, and hardware. its own self-contained fuel system. All the ignition components except the distributor. It has its own bushings and mounting hardware. the stand uses the cooling baffle on all the test runs. To run, engines don’t need a charging system. However, you will see a lot of them running in pictures with the Front alternator bracket (2900) in place, because the inboard bracket for this item fits behind the ring gear, and it is much easier to mount it before the ring gear and hub are on. The only part of the ignition you need is an E/P distributor or a dual points one. The intake on the stand is designed to mate with welded on head pipes that match the pattern I developed in 2004. I also have a set of adaptor pipes that mate the stands intake to stock Corvair heads, but this takes a bit of time, and I often try to run these engines last at the Colleges. If a builder is using his own custom intake pipes on the heads, he needs to make a set of pipes that will mate to his heads and to our intake. I will put in a good try to run such engines, but they go last and we don’t guarantee that we can do it. We have succeeded in about 4 out of 5 tries in past colleges.